NAF is a national network of career-themed academies typically located within public high schools. They are designed as small learning communities within these schools, which helps to facilitate of personalized environment. The NAF career-themes are focused on viable industries in which job growth projections are high. 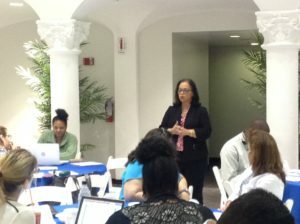 Academies select their theme based on the needs, support, and opportunities in their local community. The current Miami-Dade NAF academy themes are: Engineering, Finance, Hospitality & Tourism, Information Technology (IT), Health Sciences and new “other” theme is Education-Teaching. Q: What does it mean to be part of a NAF academy? 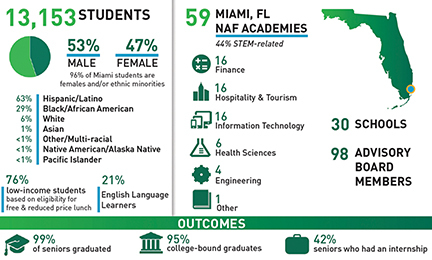 When a student joins a NAF academy, they become part of a network of over 13,150 Miami-Dade students and nearly 90,000 students across the country taking part in an educational experience designed with future workforce needs in mind. NAF students have the opportunity to learn about possible career paths available to them and begin to build the skills needed to succeed while still in high school. 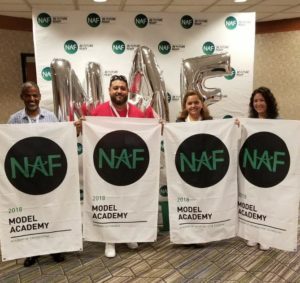 NAF academies operate as small learning communities, which allows for more personalization and advisory board members are dedicated to supporting the academy and organizing activities to prepare students for college and career. NAF students also have a network of students and alumni available to them. Q: What makes NAF different than programs my local high school offers? The NAF educational design fits within your school’s traditional educational experience. It’s not just one experience or one course. Students in NAF academies participate in career-focused courses (usually grades 9, 10, 11 and 12) and work-based learning activities that reflect the business world throughout their high school years, with schoolwork and activities becoming increasingly more focused and practical as students approach graduation. Through this continuous learning process, students are inspired to attend college with a career path in mind and have a better idea of how their educational experience will prepare them for their future careers. Q: How can I get involved in supporting my child’s NAF academy? All NAF academies have advisory boards made up of local business people and community members. Joining the advisory board would allow you to play an active role in shaping your child’s educational experience. Advisory board members advise the curriculum, projects, fundraising efforts, and organize work-based learning activities for students. Parents can volunteer as field trip chaperones, donate supplies or provide services to an academy, such as helping organize Parent’s Night; or help locate companies to host job shadow day, internships, etc. Q: What opportunities are available to students in a NAF academy? 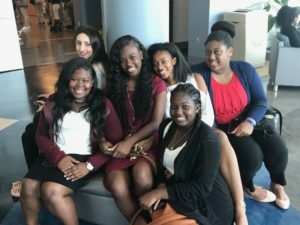 Through NAF, students are eligible for scholarships and become part of a network of nearly 90,000 students across the country experiencing that same relevant and engaging educational experience that they are receiving. In addition, NAF students who graduate with NAFTrack Certification benefit from NAFTrack Certified Hiring, a promise from some of the nation’s top companies to give special consideration to NAFTrack Certified applicants for job opportunities. Miami NAFTrack will also be introduced soon, which will connect graduates with local companies and colleges. Companies which are interested, can contact CTE Department 305-693-3030. Q: How do NAF academies partner with businesses? Join an advisory board: Advisory boards provide a critical bridge to industry by collaborating with educators to inform curricula and provide, identify, and organize work-based learning activities. 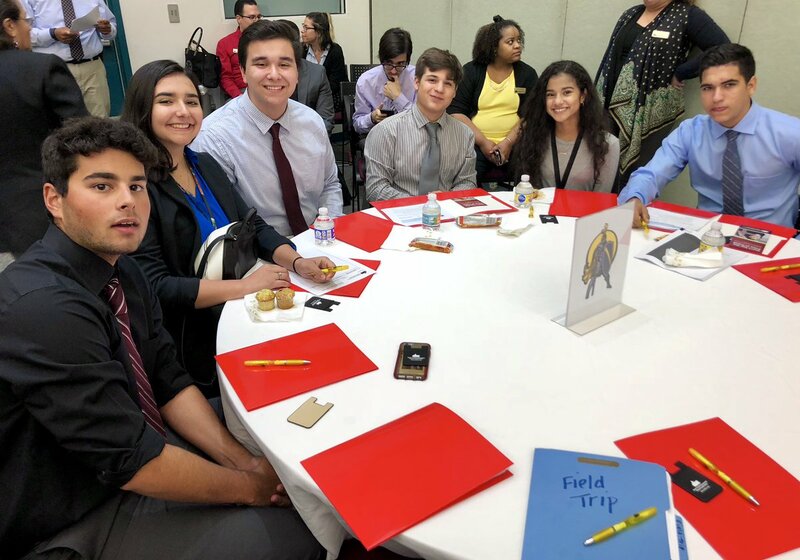 Participate or host a work-based learning activity: host a tour of their offices, participate in a career fair, host job shadows, guest speak in the classroom, hold resume writing workshops, or even participate in mock interview events. Host an intern: Paid internships are the culminating experience for NAF students and are designed to provide value to the employer. NAF strives for all academy students to have a paid internship while in high school and this is a requirement for students to graduate NAFTrack Certified. Q: What is work-based learning? Work-based learning activities provide students with the opportunity to learn from business professionals and gain exposure to the workplace. 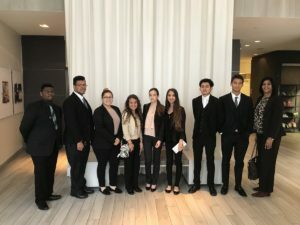 Business partners may host a tour of their offices, participate in a career fair, host job shadows, guest speak in the classroom, hold resume writing workshops, or even participate in mock interview events. Q: Is there evidence that participating in a NAF academy has positive results for students? Miami-Dade county 2017-18 graduation rate of NAF academy students was 99%, with 95% college-bound. The national NAF senior graduation rate is 98%, with 92% college-bound. Q: How will participating in a NAF academy prepare my child for success in a career? 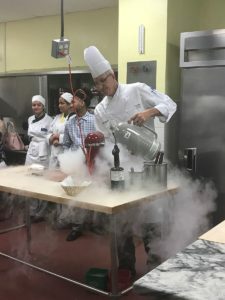 NAF academies expose children to career options while they are still in high school through career-focused curriculum, work-based learning activities, and connections with business professionals. Students learn about career pathways through activities like career fairs, mock interviews, and job shadows and begin to prepare for careers by building the skills needed to succeed. They also gain knowledge in what higher educational opportunities would align with their career goals. NAF alumni often earn more in their careers and have better ties to their communities than their peers. In addition, NAF students who graduate with NAFTrack Certification benefit from NAFTrack Certified Hiring, a promise from some of the nation’s top companies to give special consideration to NAFTrack Certified applicants for job opportunities. Q: Does participating in the NAF academy interfere with regular academic requirements? No, typically NAF courses take the place of elective courses. NAF promotes cross-curricular integration, so NAF courses actually enrich regular requirements with real- world application. Teachers use career-theme material in academic courses, such as Language Arts, Mathematics, Science and/or Social Studies; some lessons are co-taught by academy teachers. Q: What kind of coursework is taught in NAF academies? The NAF curricula is created in partnership with industry professionals and designed around projects that help students make connections across subject areas, acquire valuable workplace skills, and view their education as a step toward long-term career options. Projects have real-world application as they are resemble work environment projects. Q: Is NAF an extracurricular activity? NAF is not an extracurricular activity. NAF is embedded into your child’s daily school routine. Your child will continue to take traditional courses alongside NAF’s career-focused elective courses. Your child will participate in work-based learning activities both inside and outside of the classroom during the school day. NAF does not interfere with extracurricular activities and sports. Q: How does my child become enrolled in an academy? If your child is interested in joining a NAF academy, contact your school. 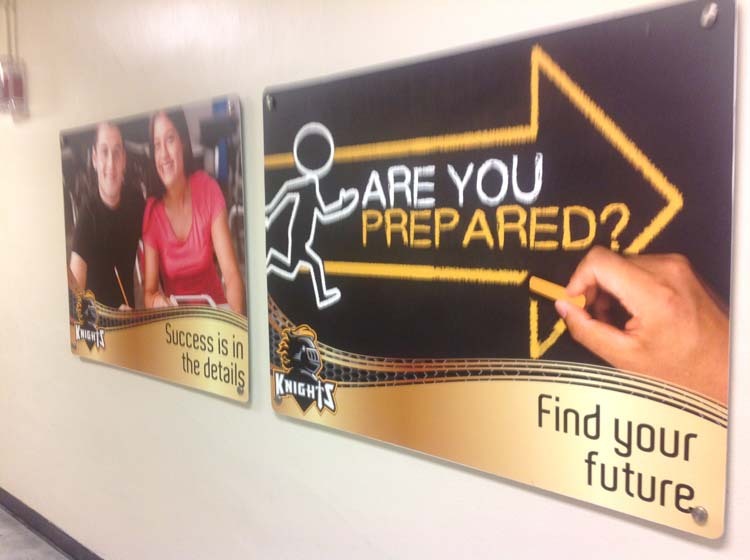 The enrollment process is different at every school. Some schools do require a “magnet” application. The current NAF academy themes are: Engineering, Finance, Hospitality & Tourism, Information Technology (IT), Health Sciences and new “other” theme is Education-Teaching. Q: What are the benefits to business partners? NAF enables business people to play an active role in developing their future workforce by shaping talent in high school.